Plastic in the ocean is a terrible problem. But there are things we can do to help. Plastic is a material that was invented by people, only about a hundred years ago. It’s useful for many things. But a lot of plastic items are designed to be used only once, and then thrown away. Think of plastic bags, or straws, or takeout cups from coffee shops. That’s a lot of plastic garbage. And a lot of it ends up in the ocean. Even plastic that has been properly thrown in the trash and taken to the landfill can be carried by wind and rain into the water, and eventually into the ocean. This causes big problems. If a sea turtle sees a plastic bag, it will mistake it for a jellyfish, its favourite food. When it tries to eat the bag, it will choke. And sea turtles are just one of the many sea creatures that end up eating plastic: birds and whales do it too. 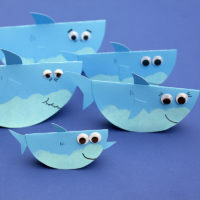 (See our Food Chain Nesting Dolls for more information on what sea creatures should be eating). Unlike organic waste, plastic takes years and years to break down. Even when it does break down, you end up with an ocean full of teeny tiny bits of plastic, like a huge cloudy plastic soup. These microscopic pieces of plastic are eaten by plankton, which are then eaten by fish, and so on up the food chain. How can we help? Caitie has some tips for us on our collaborative playlist featuring our friends at the Canadian Wildlife Federation. Use a reusable water bottle instead of buying water in plastic bottles. Use a reusable metal straw (or no straw at all) instead of a disposable plastic one. Use reusable grocery bags instead of plastic bags. Put your lunch in a reusable container instead of using plastic wrap. If we all make changes, we can fix this problem. Make every day Earth Day! 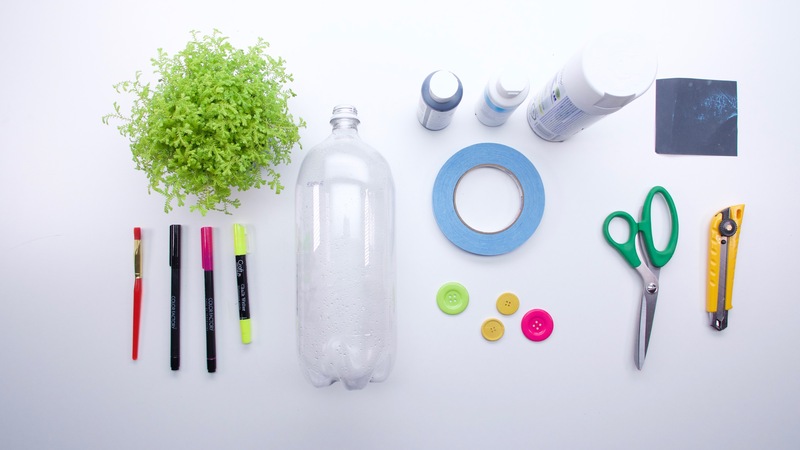 Here is a fun and easy way to reuse a plastic bottle! 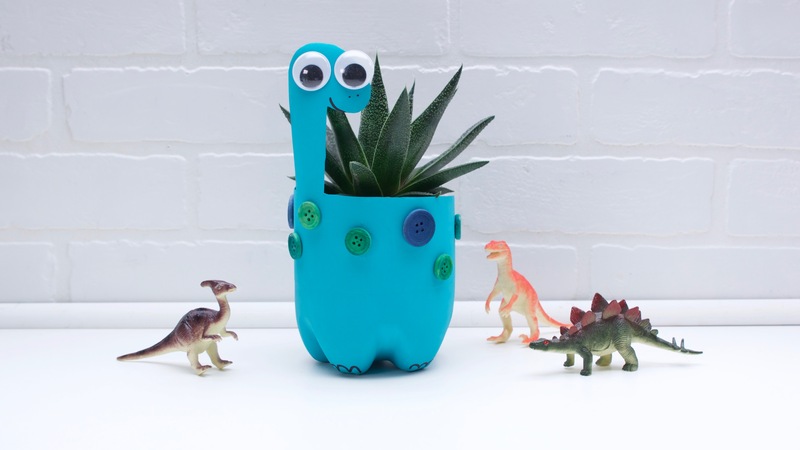 These are the basic instructions for creating your very own Peekaboo Cat or Dinosaur planter. Inspired to create another character? The sky’s the limit! Please note: Have an adult use the utility knife, spray paint, scissors and hot glue. Leave the decorating to the kids! 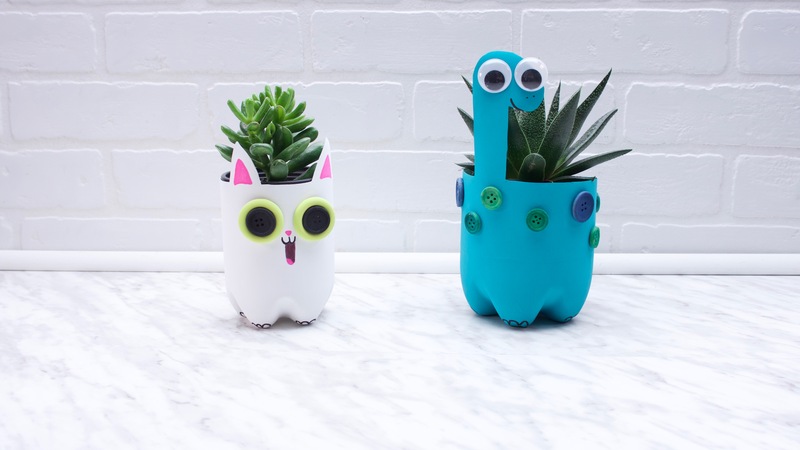 Note: Have an adult use the utility knife, spray paint, scissors and hot glue. 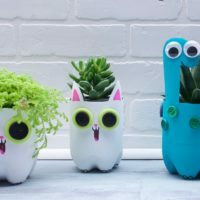 Leave the decorating to the kids! 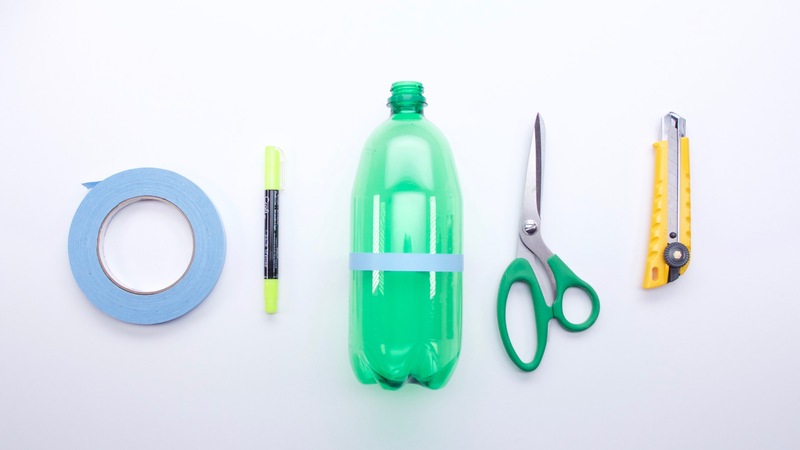 Use the masking tape to tape a line around the bottle. This will give you a straight line to cut. 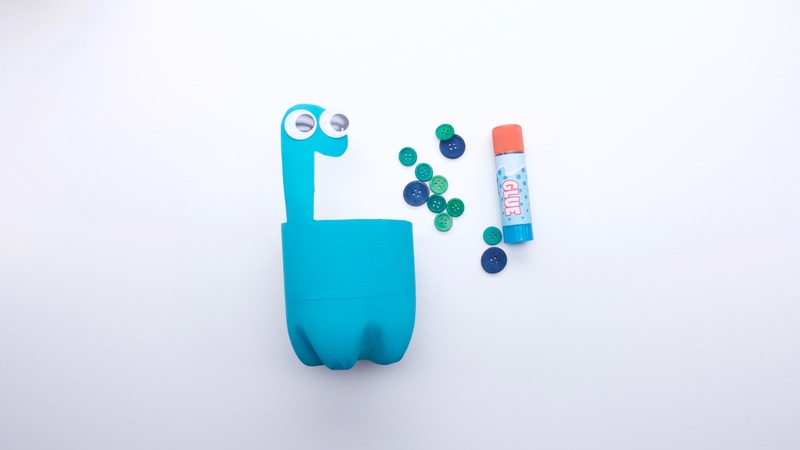 Dinosaur: Use the chalk marker to draw out the neck of the dinosaur above the masking tape line. Tip: Chalk marker can wipe off easily later. 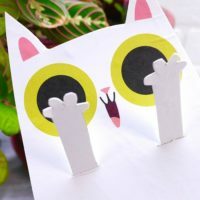 Peekaboo Cat: Use the chalk marker to draw the ears above the masking tape line. Pierce a hole in the bottle with a utility knife. Tip: keep the blade retracted, only exposing the tip for more control. With scissors roughly cut out your shapes. After the top of the bottle is removed go back around and clean up the edges. Lightly sand the outside of the bottle to roughen the surface. This will help the paint to stick. Wipe clean (make sure bottle is clean and dry). Paint the bottle with chosen shade of acrylic paint, this will take several coats. Tip: use a hair dryer to speed drying between coats. Spray paint made for plastic can be used if you already have a can at home. Peekaboo Cat’s eyes are made of two different sized buttons attached together (the bottom painted bright green, the top black). Draw in mouths (use pink marker for Peekaboo Cat and black for the dinosaur), noses and toes. Add aquarium rocks to the bottom of the planter if desired. Then fill with soil and plant. Don’t forget to follow us on Twitter, Instagram and Facebook! 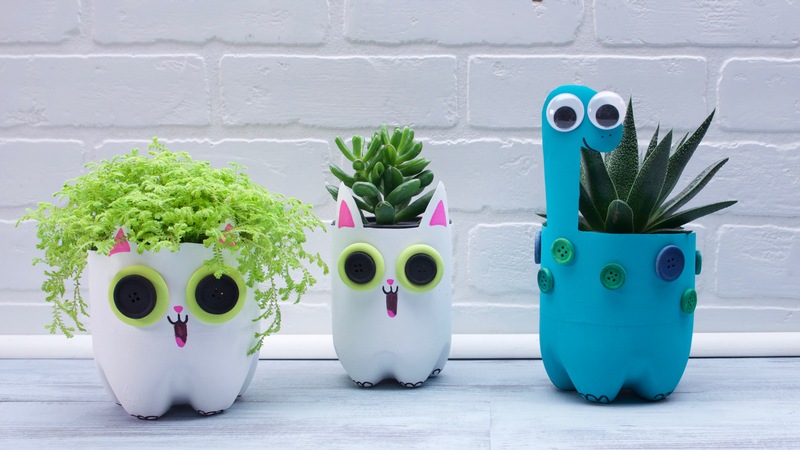 Did you make your own planter? We’d love to see them! Share your photos on social media using the hashtag #SuperSimpleOfficial!